Moist, tender zucchini bread, perfectly spiced with cinnamon and cloves and studded with chopped walnuts. 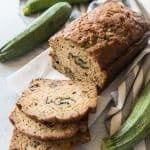 This is the best zucchini bread ever and the perfect way to use up all those zucchini that are growing in the garden! Preheat oven to 325 degrees. Spray two 8x4-inch loaf pans with cooking spray. In a large bowl, combine the oil, applesauce, sugar, eggs, and vanilla. Using a stand mixer or hand mixer, beat until creamy and light. Add the flour, soda, baking powder, salt, cinnamon, cloves, and zucchini. Stir to combine, scraping the sides and bottom of bowl as necessary. Stir in chopped walnuts. Pour the zucchini bread batter evenly into the prepared loaf pans and bake for 50-60 minutes at 325 degrees, being careful not to overbake it. You can test for doneness by inserting a sharp knife into the middle of a loaf and checking to see whether it comes out clean. Remove the loaves of zucchini bread from the pans and allow to cool on a wire rack, then store in ziploc bags.